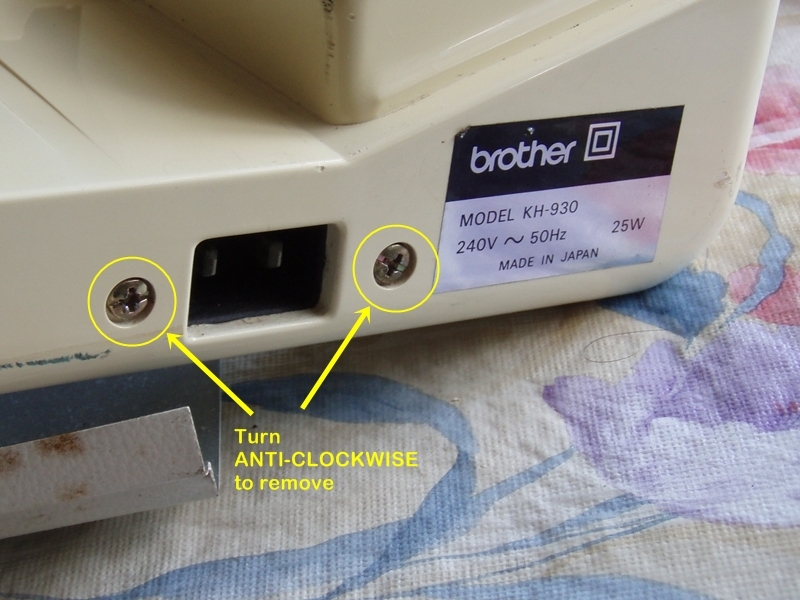 So you have a Brother KH930 Knitting Machine that you have let the smoke out of, and now it wont turn on, beep, boot up, power up or respond to any hitting or cursing. As is commonly known, all electrical items actually run on smoke, once it comes out, the item will not work. 🙂 I found it was some small capacitors that released the smoke on this knitting machine. My mother had collected this KH930 after it had stopped working, hoping I might be able to fix it. The previous owners had removed the needles for use as spares on other machines, that is why there are none in the photos. You do not have to remove the needles to perform this repair. This fix may work for other models too, I would guess any that have the power lead that plugs directly into the side of the knitting machine. Not ones that use a “plug pack” or “power adapter”. 230/240/250v AC models should be the same components, 110v I don’t think would be the same value capacitors. WARNING: Seek professional advice if unsure! 240v is dangerous. Always unplug the knitting machine, or anything electrical for that matter, before opening! Switch it on and off (while unplugged) a couple of times to help discharge any electronic components that may hold a charge. Even though I had no issues with this repair, I will not be held responsible for any injuries sustained performing this repair. 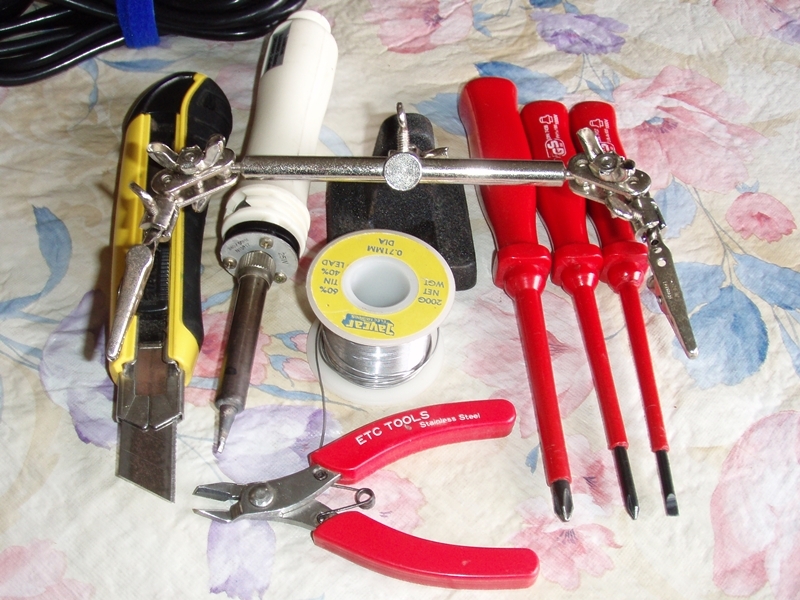 Very basic soldering skills are all thats needed, and if you have never used a soldering iron before, it is quite easy to learn, just grab a cheap fine tipped soldering iron (under AU$10) and I think you will do OK! I will try to get a video online soon showing the basic skills required. Each photo can be clicked on to enlarge, click the “BACK” button on your browser to return to the page. We may as well go into the tools required for this particular job. 1. A fine tipped soldering iron suitable for electronics. 2. Some suitable solder (mine says 0.71mm diameter, 60% Tin, 40% Lead). 3. A Number 2 Phillips Head Screwdriver (maybe a smaller one too depending on your machine). 4. A small flat blade screwdriver. Step 1: Disassemble the Knitting Machine. Carefully turn the machine over. At the end where the power lead plugs in you should see the 2 plastic rivets indicated. Carefully slip a fine blade under the edge and lever outward. The second shot shows how the plastic rivets work. The centre/cap slides out leaving a small hole in a smaller part of the rivet, remove the smaller part too. There is one to remove on the back of the machine also. 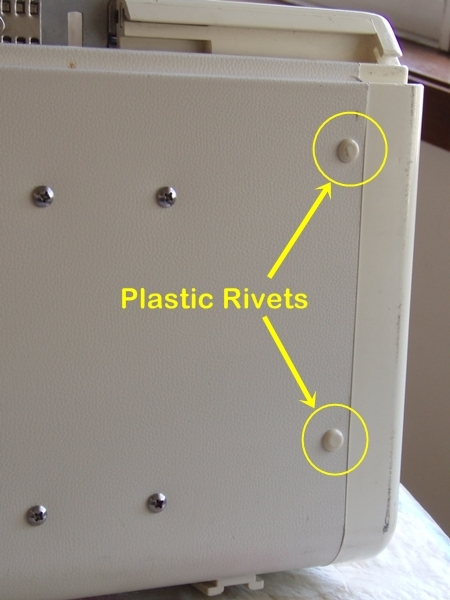 3 plastic rivets in total. 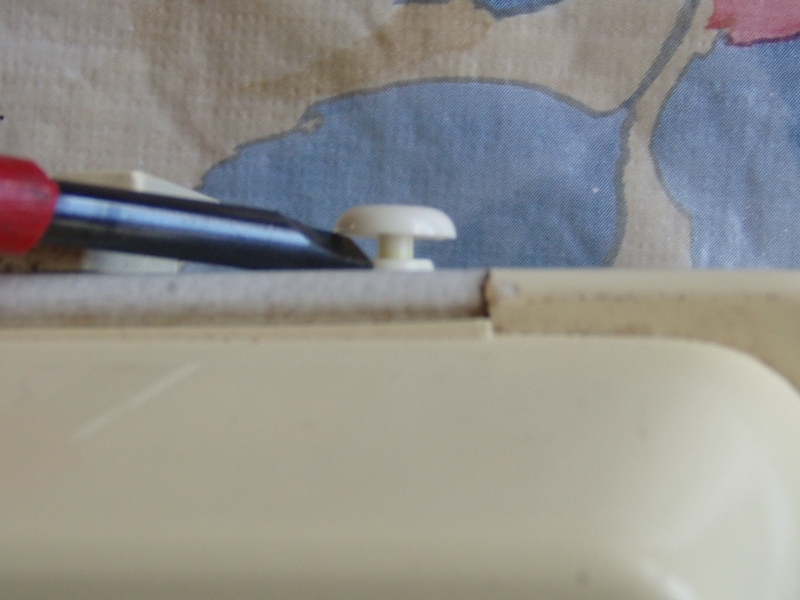 Next, flip the knitting machine back over to the correct side facing up and remove the 3 screws from the bed. Take note of which screws come from where, they are different! On the Brother KH930, the 2 in the main bed are countersunk, the one near the gate pegs is ‘pan head’. Slowly work the plastic end of the knitting machine apart from the metal bed. The power switch may want to stay behind, thats fine, it should wiggle free eventually, it is held back by the transformer inside. Next, remove the screws holding the power socket in place. There is actually a metal plate around the back of the socket so as you unscrew, it sort of feels like the screw is just spinning because there is no outward pressure to push the screw out. You can see inside that unscrewing is pushing the metal backing plate backwards instead. Keep going until it is free of the screws. Inside where the power cables go, there is a plastic retainer with two screws holding the cables in place, remove the screws to release the retainer and allow the circuit board to slide out of its little hidey hole. Take a mental note of which way up it fits in. Set the plastic case aside. Now we can see the top of the circuit board. 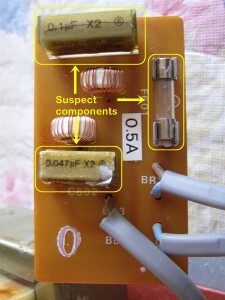 The fuse can be popped out (it was blown) and the capacitors were visibly damaged, one of them was split open. Luckily the details of the capacitors were still legible, take a photo or write down the details before touching them as they may turn to dust when touched and those seemingly random numbers and letters are very helpful! If you live near an electronics store, take the components with you once they are removed. Hopefully the sales people will know what to replace them with. The 2 capacitors and one fuse should cost you much less than AU$10. I got 5 of each for AU$15. The Brother KH930 Knitting Machine I am working on used one 0.047uF 250V AC Mains, Metallised Polypropylene Capacitor, X2. One 0.1uF 250V AC Mains, Metallised Polypropylene Capacitor, X2. Oh, and one 500mA M205 Quick Blow Fuse, 5mm round x 20mm long. Plug in your soldering iron, the fun is about to start! Make sure it is away from anything that might melt or catch on fire, including children. As long as the tip stays up off the table by about 30mm, it should be fine. If you have a brand new soldering iron, touch some solder onto the tip until it melts and coats the tip a bit, this aids in the transfer of heat. 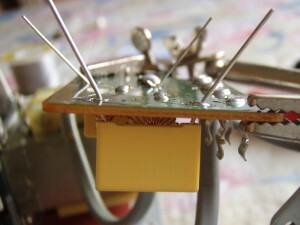 Carefully touch the tip of the iron onto the blob of solder holding one of the legs, at the same time rock the capacitor slightly back and forth with your other hand, with your third hand, try to push the flat screwdriver under the capacitor without scratching the circuit board! This is where I decided to use the adjustable job holder thingo. It can also be done without the screwdriver, but it does make it easier. With some careful levering, not scratching the board, the combination of rocking the capacitor and lightly pushing with the soldering iron, the offending leg should eventually pop free out the side where the capacitor is. Repeat for the other 3 legs. Try not to overheat the board, the solder just has to be soft/liquified, not boiling. 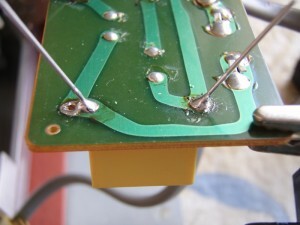 If you have loads of solder on the iron tip, wiping quickly on a piece of paper or slightly damp sponge will remove it. You do want a thin coating of solder on the iron as this transfers heat better to the solder job. We also want to make sure the holes are free from solder, just use the tip of the iron and lightly sweep across the holes, removing excess solder from the iron each time, until the hole opens. You do not have to scratch away at the solder with the iron, it will just wipe away when hot, with the iron, don’t touch it with your fingers! Insert your new capacitors into the relevant locations (the 0.047uF into C602, 0.1uF into the top spot). Bending the legs outward slightly holds them in position for soldering, do not cut the legs shorter just yet. 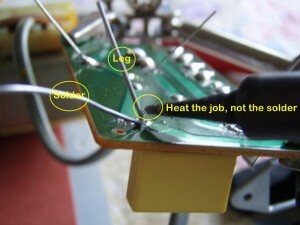 Solder the legs in place by heating the leg, down near the joint, with the tip of the iron. The capacitors I got were pre-tinned, so I required very little extra solder to make the join. You may have to feed a little of the solder along the leg (while the iron is making the leg hot) so it creates a small mound up the leg. A good solder joint is pointy like a volcano rather than rounded like half a ball. Give your freshly soldered legs 10 to 30 seconds to cool, then trim them off with some sidecutters. The less sharp leg sticking out, the better, although its not critical. Thats it! Snap your new fuse in and you are finished! Easy! 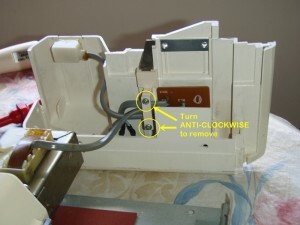 You can now do the reverse of the Disassemble a Knitting Machine to put it back together. I like to test things before they go back together, but if you accidently touch something while the power is plugged in you could be in for a nasty shock, or your family will be… Put it back together first! I don’t believe it, I fixed a knitting machine! Once everything is screwed together and plastic rivets are pressed back in, plug it in and turn it on! 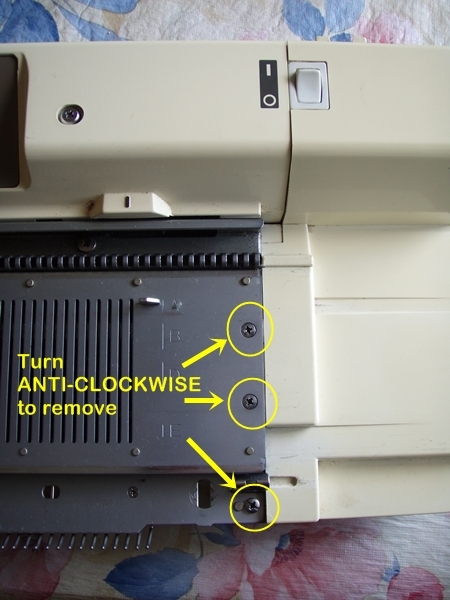 If more smoke comes out, or it still doesn’t work, start from the top and see if the fuse is blown, there may be something more serious wrong with your knitting machine… sorry about that! Please feel free to leave a comment or ask a question about the above procedure! Thanks for reading! I have been looking at electronic knitting machine but reluctant to buy. Your artical has eased some of my questions. Thank you for taking the time to write this artical. I found a free kh-910 – free because it won’t turn on. I am looking forward to opening it up and seeing what may be lose or blown. That you have written here will be extremely helpful. It has been a few decades since my radio building days! I hope you get it going! Thank you for your Article. We are a knitting group in Vienna, Austria and we had the same problem. We found your Article after preparing the machine by ourself. The values may differ depending on where you live. The place I buy them now calls them 47N for 0.047uF and 100nF for 0.1uF. I would advise replacing both. I have done a few of these repairs now and in each one, they have both been damaged. It may only be a matter of time before the other one decides to fail. by the way ,I Love your site Its Very helpful in deed. 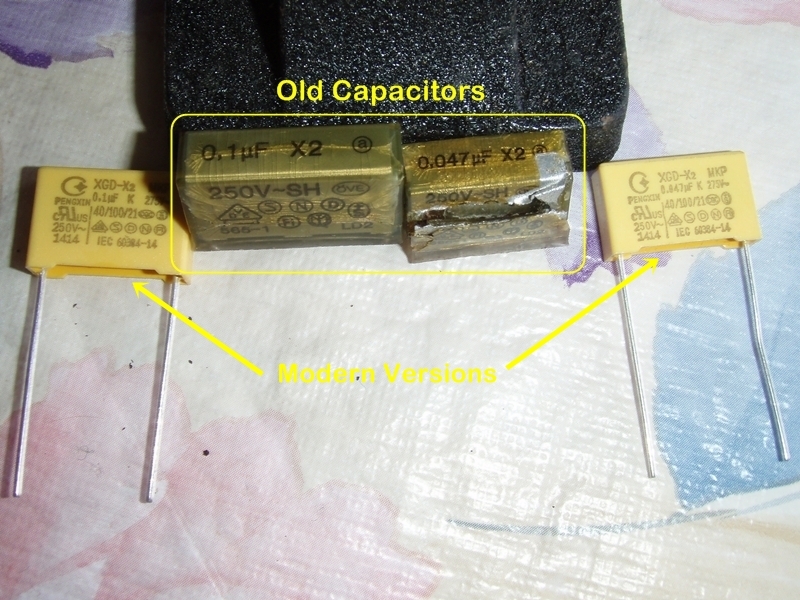 As far as I know, it should be 240v (the ones here in Australia are) so as long as someone didn’t bring it back from the US, it should be 240v… If you follow the instructions above on how to fix it, you should be able to see what values are on the capactiors, eg. the ones I have pictured show 250V and the new ones 275V. I would be pretty confident that they have blown just like all the others I have seen, it seems to be a common problem. I have managed to get all the parts for my Brother KH950i that has no power like the one you show. If we manage to get power back will this have affected the built in patterns in the computer? Anyone in the UK looking to have a go with your repair will find that Maplins stock the replacements. The computer should be fine, have not seen one lose its patterns. The effect of these components blowing is really the same as if there was no power cord plugged in. Thanks for the tip for the UK machine knitters! Let us know if the repair worked for you. Also, feel free to comment on how my instructions could be changed to make it easier to understand or if they are OK.
I’v just read your article, and hope that you might be able to help with question I have. I live in the UK and have a Brother 950i. Next month I will be moving to the US and want to take my knitting machine with me. I could obviously by another one while I’m there, but would love to use my old trusted machine instead! I understand that the problem is likely to be to the UK using 240V and in America its 10W. I just wondered whether I could buy an adapter, or perhaps there is an additional lead that you know of, or even some tinkering I could do inside it? Otherwise, I’m sure that the power will blow! I’d be grateful for any advise! My mother suggests checking out sewing machine type shops also as many have the same power lead. Grab a photo and some measurements of yours and show it around, someone might recognise it! Good luck! You are correct, UK is 240Volt and the USA uses 110Volt. You should be able to source a “Step Up Transformer”. If you know of any electronics or electrical type shops near you, they would be better to talk to regarding the size you need. This link will give you an idea. NOTE: I know nothing about this seller, it’s just an example of what you are after. They seem to be UK based. Thank you for this tutorial I have mended 2 very successfully, my third machine a 910 came on but the pattern display woud not work even though the lights are on, we checked the fuses under the board and it had blown the 1 amp fuse, I replaced this and it blew the replacement as well, I just wondered if you had any suggestions as to what I could try next! I would be very grateful. Fantastic. WHat wonderful instructions you have given. THank you. What a brilliant article. I wish I’d found it sooner. I bought a garter carriage on ebay a week ago but it didn’t work properly. It would start but die almost immediately. This was the second I had bought that didn’t work but it was worth every penny. The first carriage came with a joblot of knitting equipment bought last year. That one had no life at all even though I changed the plug fuse. But when I switched power packs the first carriage worked perfectly with the second power pack. So knowing that the first power pack was at fault and that, according to the service manual, it can be opened and fixed, I bought an electronics book. That book gave the same info as you without the excellent pictures. I will have a go at fixing the power pack and then maybe the second carriage. Tiny ball bearings keep dropping out of it. gave me the confidence to make the purchase. The previous owner only used the machine a few times. She included the “pen” and great knitting reference books. Having phoned a few repair people who said don’t waste your money on mending this machine, I followed your instructions, changed the fuse, and now I’m back in business! Your instructions and diagrams are so clear and easy to follow. Just wanted to let you know that I followed your instructions and successfully repaired a Brother 950i with the exact same capacitors and fuse specifications. Thank you so much for making this guide available, I would have been lost without it! next month I’ll have him take a look. I must say, the information you provided here is invaluable. Thanks a million, i have succeeded in fixing 3 KH 950 by just following your instructions. I can say that many Duth owners of a 930 or a 940 used your website and made that their machine could operate again. Hello, I have exactly the same problem with my Brother KH 930. Can you tell me the specs of the capacitors you used to replace the ones on the circuit board? You have told me what was on the Brother but not what you replaced it with. I am just about to take off the casing on my Brother 950i! Bit nervous, but have read all the instructions. Just the soldering bit afterwards. Really good infos and well documented, many thanks. 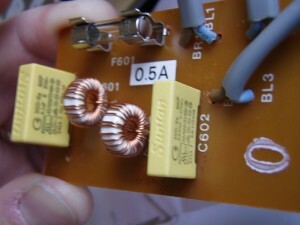 For anyone who cannot get the caps or cannot solder, there is another possible way, that is to buy an IEC socket (the one on most Desktop PCs, but not laptops), make sure you buy one with the mains filter if the caps on your present filter PCB are destroyed in some manner. Then you can remove the filter PCB completely. Remove the end cap as detailed above. 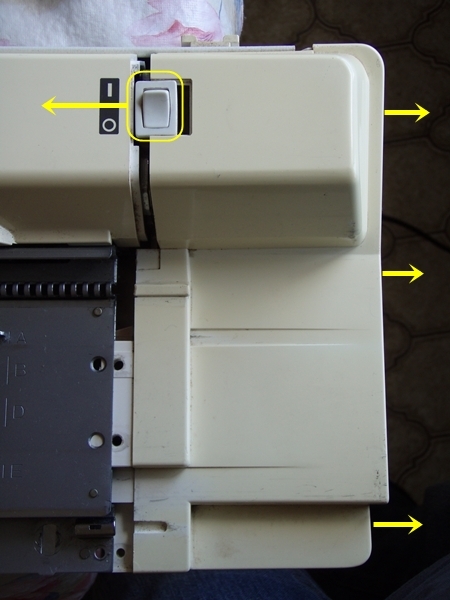 The normal IEC connector is good where you only want to replace the Japanese socket (the replacement Japanese cables are between $20-$30 in the USA I see them on ebay….even the screw holes are the same distance apart! The IEC sockets are very cheap as are the cables. 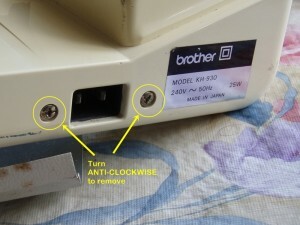 For either of the IEC sockets I have mentioned, you need to make the hole in the plastic of the Brother larger for the socket (mount externally! ), but not by that much, a file or a Dremel can be used (or both!!). Do not use a knife, you may slip and cut something that you shouldn’t! The IEC socket with filter is much longer and you need to remove the small filter PCB completely (in a 910 anyway), it is not required with the filter IEC and connect the transformer directly via an inline fuse of the correct value. There are IEC sockets with a fuse holder built in, but they are usually larger/Taller and the screw holes will not line up anymore, you will need to make two new holes, also OK.
Use 3mm machines screws with locking washers and or locking nuts to hold the new socket securely, any of the ones I have mentioned. The cables are cheap to purchase, even new ones, with the correct plug for your country, and there are many secondhand ones around in a good condition (speaking of the UK, USA and Germany at least! )…Get a long one!!! There are cables with a plug with a 90° turn that may prove even better for some people…. I almost forgot! The earth connection Is the pin on its own! This is not needed for Brother machines it would seem. So leave it unconnected. If you are not 101% certain which pin is not needed, talk to an electrician. 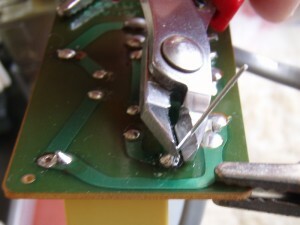 The ones I bought have 6.3mm spade ends on the machine side, so are easy to connect to the original Brother wiring, BUT DO NOT solder to these tabs, you may simply damage the socket!! 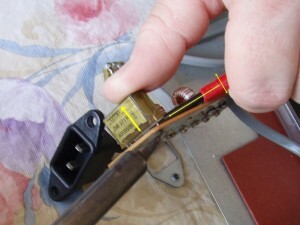 Use the right tool to compress the right connectors….No soldering needed. Get an electrician to check your work before plugging in…. If anyone needs further help, just ask!! I hope this helps a few people here…. Thanks very much for this tutoriel it is very well explained and it saved my day!! And money! Without you, my machine will not work, thank you for your explanation I could to repair myself. It was very clear and well illustrated, thank you again. I just wanted to thank you for your tutorial! It’s much appreciated and I’ve just fixed my kh-950i using your tutorial. i wonder if i can use one like you mentioned in your tutorial just as long as it is the same voltage. and i hope you don’t mind my linking to your tutorial as soon as i repair my km. Because the fuse keeps blowing, there might be something further wrong. If you have not already replaced the other parts from the instructions, I would do that. 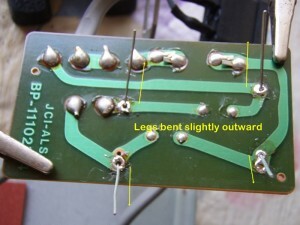 If you have completed that, make sure there wasn’t some stray solder shorting out anything else on the board. Apart from that, it could be difficult to track down, look for burned patches on the board and on the plastic housings of the machine, they might indicate where the issue is. As you have a couple of machines, as long as they are all the same, try replacing a working board from another machine to see if it blows too, it could be something deeper in the machine. Good Luck! It’s been a while since I’ve updated this site, apologies everyone. Hopefully my reply might help someone else if you have already fixed yours. Hi Neki, they look to be the same specifications. The above repair will work. Good Luck! Wow, thanks Andy! I never thought of replacing the whole thing. I might get a hold of a dead machine to try this repair. 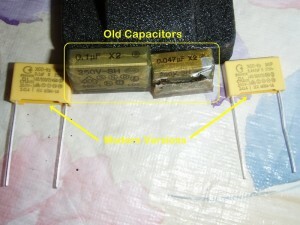 My theory was, the old capacitors lasted years, the new ones should too. I will definitely try your suggestion. Thanks again! I got a KH 910 from my mother in law’s friend and when I set it up, plugged it in and switched it on it had smoke coming from in amidst the needles at the bottom end, the smell was awful. I was gutted, I thought that’s it. 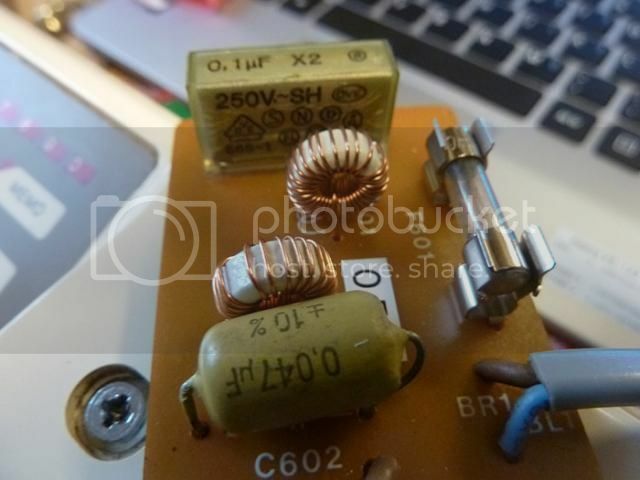 Opened up the machine and was greeted with a blown out capacitor, so went to Maplin to replace both capacitors and the fuse (a whooping £2 all in). Even my very basic soldering skills saw me through just fine. Thank you!!!!! I’ve fixed my Brother 930! Best wishes!!!! Followed your instruction step by step and got the “smoke back in” a Brother KH 950. Now all I need to do is work out why the pulse/stepping motor on the sheet reader is getting to hot! Thank you very much!! 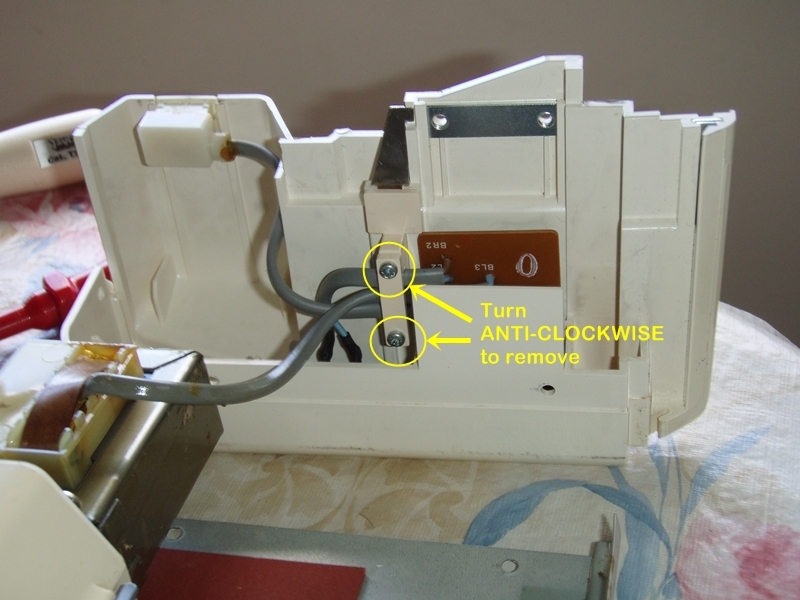 I’ve just repaired my 950i from these instructions – the parts are identical. Just a thought – I found a desoldering pump invaluable to get rid of the old solder and leave a clean hole. 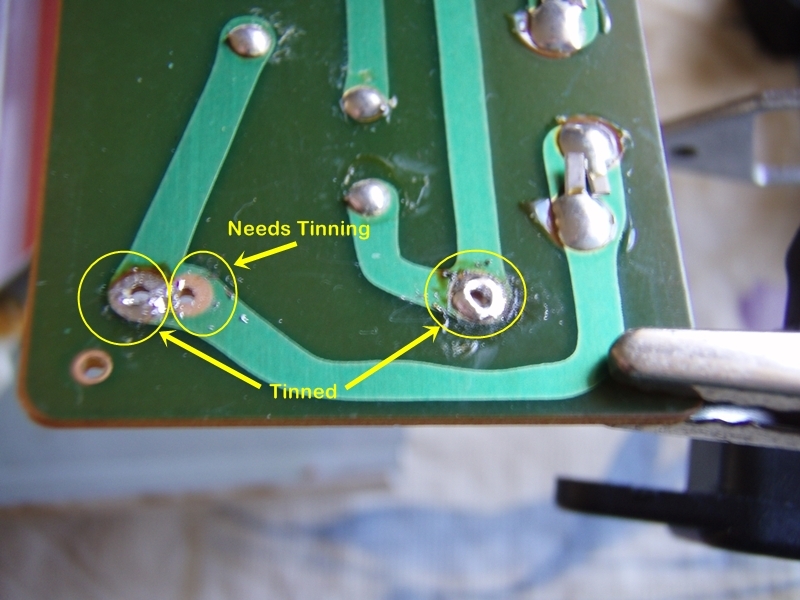 There’s no need to lever up the old capacitors and risk damaging the board, they come free quite easily once the solder is gone. Desoldering pumps are freely and cheaply available. just want to say ‘excellent instructions’ and ‘I’ve just fixed my knitting machine’. Thank you so much for sharing this. It was fairly easy to get the replacement components. And although new to soldering; I discovered it wasn’t as complicated as I imagined and your guide encouraged me all the way. My knitting machine had been stored for 10 years and although it lit up when first switched on it ‘popped’ within seconds and there was smoke just as you described. What a relief to find your page and the chance to mend it. Wow! thanks again.